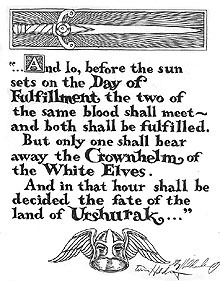 In 1979, Bantam Books published Greg and Tim Hildebrandt's first fantasy novel titled URSHURAK. The final pencil pieces that were used as interior illustrations are some of the finest pencil work the Hildebrandt Brothers have created. This piece of The Prophecy appeared in the pages of the book. URSHURAK stayed on the New York Times Best Seller List for six weeks. Very few of these special pieces are still available.